a stand at the top is built into the ladder so that the ladder is always attached to the stand once it is assembled. The ladder comes in several 3 or 4 foot sections and the stand height is usually between 12 and 20 feet high. It is essentially a platform at the top of a ladder and is made from heavy gauge aluminum or steel. Some hunters even make their own out of wood. 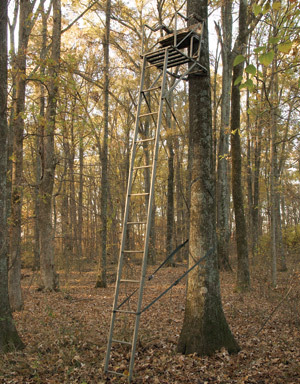 Most ladder stands come with a seat built into the platform at the top. The seat can be a one man or two man seat. The two man seat is normally referred to a "double seat", great for those who like to bring along their young son or daughter to enjoy a day of hunting with them. Ladders tree stands are very safe and extremely stable when erected properly and are very easy to climb. They often come with a shooting rail which also provides an additional level of security to prevent a fall when re-positioning in the seat. There are disadvantages however. These stands are heavier (average 45 pounds) and must usually be transported by ATV or cart to get it to your stand location. It is possible to carry them in, but it may take several trips as the ladder sections are usually made of steel. With a ladder stand, it will take at least two people to safely put it up against a tree. I have tried it by myself and would not recommend it. Three people would even be better. Ladder stands can be fastened to the tree using ropes, chains, ratchet straps, or cam buckle straps. I prefer the ratchet straps... they allow you to fasten the stand tightly and securely against the tree. Most ladder stands also come with a stabilizer bar that extends from mid-way up the ladder to the tree to keep the ladder from bowing in the middle while climbing. The nature of the ladder stand also makes it a bit noisier to set up and may require more time for the hunting area to "cool down" after you set up your stand. Although this type of stand is relatively easy to set up, it does take a little more time than other types of stands, and is not easily transportable. This usually mean that once set up, the stand is left in the same location for the duration of the season. It is commonly used on ones private property as a permanent stand.